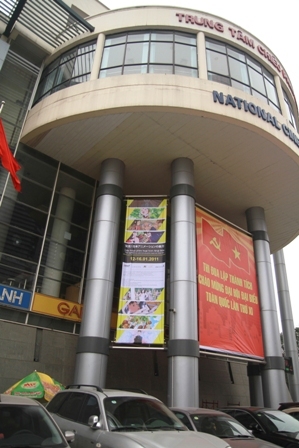 Hello everyone, this is Nha from Hanoi. Yes, Mio-san, time passes so fast. I cannot imagine that it was one month ago when I was enjoying my Tet holidays (Vietnamese new year holidays) at my home town in Hue. Fuki-san, as you might know, we celebrate a new year with lunar calendar, not with the Western calendar. This year the first day of a new year fell on 3rd February. I enjoyed the re-union of my family members at my home town, and ate a lot of foods for a new year. My new year begun with wonderful news from Japan. 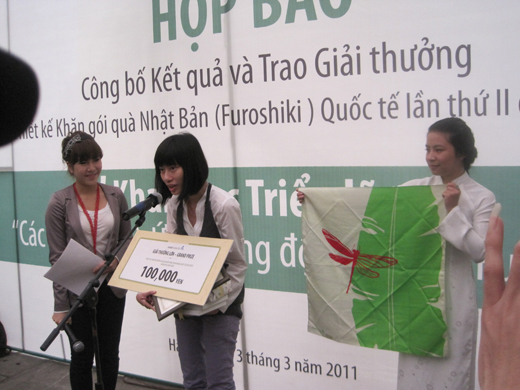 In the 2nd International Furoshiki Design Contest for Students, 5 Vietnamese students (4 designs) won the prizes, including the Grand Prize. We then organized the awarding ceremony for the students at the yard of our center on the occasion of the opening ceremony of the Furoshiki Exhibition. 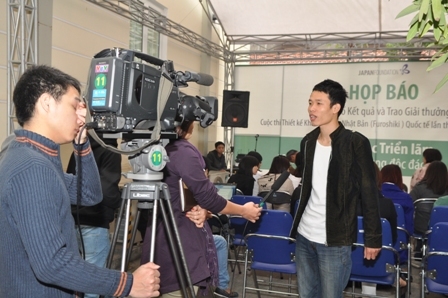 The awarding ceremony received quite high attention from Vietnamese media and general public, and over 100 guests, including television crew and news reporters witnessed the ceremony, as well as the interviews with the prize winners. 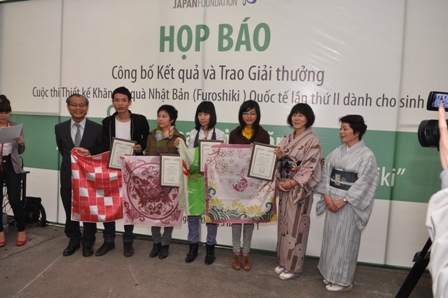 Mr. Takeji Yoshikawa, the Director of The Japan Foundation Center for Cultural Exchange in Vietnam (on the left) and the awardees. The awarded students shared the happiness of winnings, and exchanged their Furoshiki one by one, before going back to their own home towns. I think that this design contest not only connected the two cultures but also connected fine arts students from different cities. I hope this contest will be continuously held to encourage students to challenge themselves in an international scene. 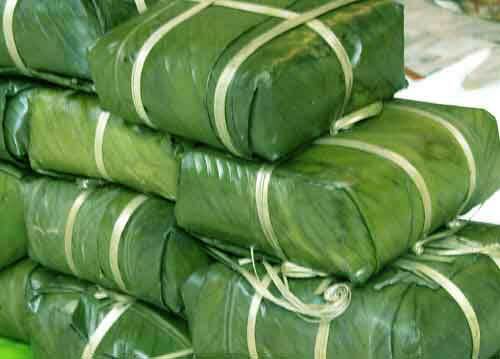 Next is a report on a big event before the Tet holidays. 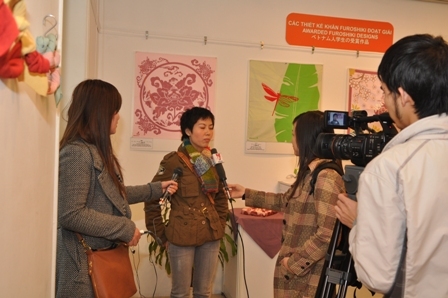 In the middle of January 2011, our center co-hosted the Japanese Animation Film Festival (JAFF) “Discover the Excitement of Japanese Animation” in Hanoi. 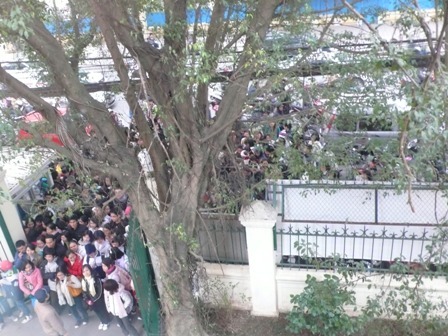 Japanese animation is quite popular in Vietnam as well. 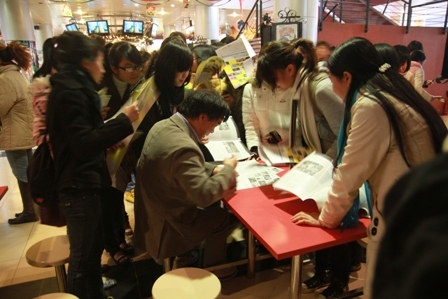 Such animations as Doraemon, Detective Conan and Pokemon are widely recognized and admired by a plethora of teenagers. 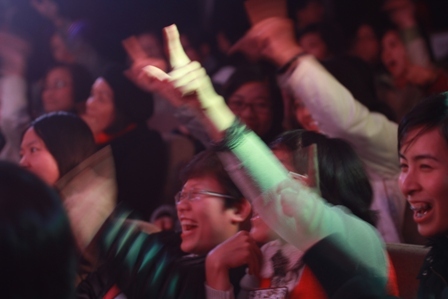 However, this time our aim to organize the animation film festival was to introduce the diversity of Japanese feature animation films to Vietnam. 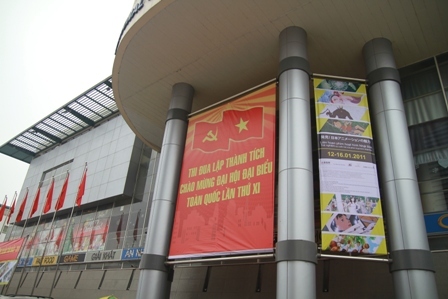 So we were not sure how degree we would get attention from the public for such unknown films for Vietnamese. 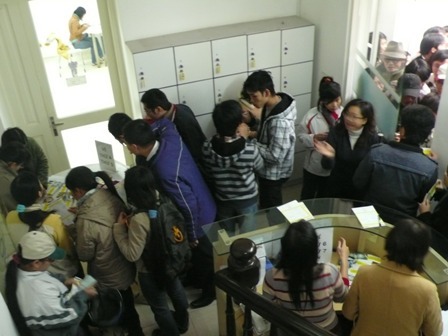 However, we found that it was imaginary fear when we opened the ticket distribution booth at our center. Or even surprisingly, the reaction from the public was over our expectation. On the very first day, our center was packed with over 1,000 people who came to pick up the tickets for the animation film festival. Not only the legendary famous animation “Spirited Away” by Hayao Miyazaki, the tickets for all of the other 7 films as well as one mini live by a voice actress were distributed out within two days. This means that the combination of the words, “Japan” and “Animation” itself has enough attractiveness to trigger the attention from the public. This is exactly what Joseph Nye called “Soft Power,” I thought. 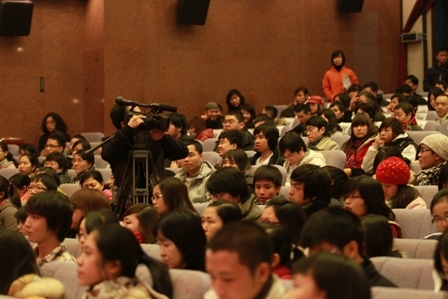 On the opening screening day, all the 470 seats were full. 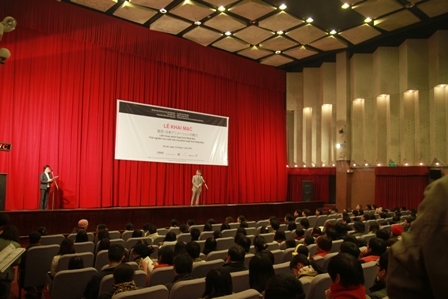 A lot of audience came to see the “Colorful” directed by Keiichi Hara, including the vice director of Vietnam Cinema Commission, Mr. Huynh Vinh Son, an animator and one of the Cultural Leaders Invitation Program participants, Ms. Phuong Linh & Mr. Nguyen Manh Hung, visual artists from Nha San Duc, to name the few. It turned out that Ms. Phuong Linh is a fan of Keiichi Hara. When the movie was finished, Ms. Phuong Linh, Ms. Linh Dung (one of the member of Dai Lam Linh group, a famous experimental music group in Vietnam) were bursting into tears. They said the movie was so moving and it was so talented for the director to send a valuable and lively message via an animation movie. It seems that this movie changed the mind of many Vietnamese audiences that animation movies are only for children but also for adults. From the questionnaires, I found that “Spirited Away” by Hayao Miyazaki & “Summer Wars” by Mamoru Hosoda received the highest scores in satisfaction and comments, while I myself became a big fan of “Mai Mai Miracle” by Sunao Katabuchi. Coincidently Mr. Nguyen Anh Tuan, a performance artist who participated in JENESYS creator program, also told me that “Mai Mai Miracle” was most impressive for him and it reminded him of his childhood memory. 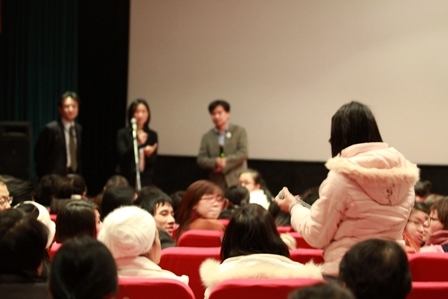 Talking with Director Sunao Katabuchi after the screening of "Mai Mai Miracle"
In total, the JAFF welcomed 3075 audiences with 16 screenings and one mini talk and live shows of the voice actress Mitsuki Saiga. The talk and mini live show by Mitsuki Saiga is also worthy to mention here, as it was the first attempt to introduce a voice actress to Vietnam. 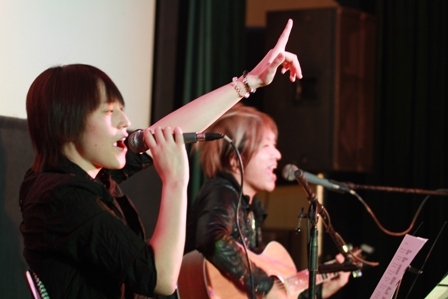 Mitsuki Saiga, the Japanese voice actress holding the Overseas Fan’s Choice Awards at the Seiyu (voice actor/actress) Awards 2010, came to Vietnam to talk about her career as a voice actress, and sang her songs as Mitsuki Saiga feat. JUST with the guitarist Kazuya Nishikawa. 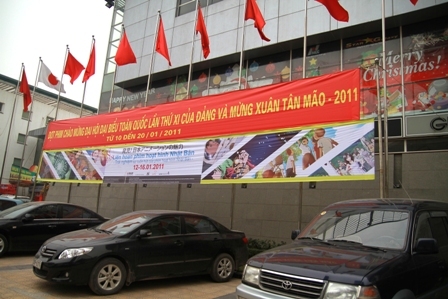 Though this program was held only in Hanoi, there were Vietnamese fans from the other cities including Ho Chi Minh City. They came to Hanoi just to meet with Saiga, joining in Saiga-san’s talk show and expressed their admiration on Saiga-san’s voice. They said they were very excited to meet Saiga-san in person and hoped those kind of activities would be organized in Ho Chi Minh City in the future. Saiga-san is singing "Just go ahead"
Well, again, my blog will take your time to read through but I hope that you will find it informative and interesting. I am also waiting to see some update information from Nunzia.